Investment must posses an intrinsic growth rate of at least 15% or more on an annual basis. The potential price/earning's valuation of the stock should be equal to or less than one times the annual growth rate. It should have a positive quarterly earnings growth comparison. The company's stock shoud show an upward price movement and improving volume. As a member of BullsToBears.com, you will receive unbiased “hand-picked” investment recommendations that are constantly refined and adjusted to reflect changing market conditions. If you’re fed up with investment services that offer nothing more than computer-generated stock picks and vague information about when to buy and sell, you’ve come to the right place. Short-term trading refers to those trading strategies in stock market or futures market in which the time duration between entry and exit is within a range of few days to few weeks. There are two main school of thoughts: day trading and trend following. It can last for as little as a few minutes to ... Recognizing the right possible trade will mean that you know the difference between a good potential situation and the ones to avoid. Our flag ship product, the Short-Term Mover, is usually held for a maximum of 20 trading sessions. Generally speaking, we seek returns of no less than 12-15% return on each investment. In short term plays, our strategy is to buy stocks that are apparently oversold due to numerous factors: adverse news, short selling, and profit taking. Intermediate-term trading refers to a general movement in the price of a securities performance that can last from three weeks to a six month period. Analysts will observe for cyclical behavior in a security to explain an intermediate trend. If a long-term bull market is discovered with consistent reactions and rally every couple of weeks, the analyst may perceive the trend as bearish without taking away from the long-term bullish trend. Our Intermediate Term buys are usually held for a maximum of 45 trading sessions. Generally speaking, we seek returns of no less than 20-30% on investment. The intermediate trade strategy is to seek out stocks of viable companies that appear undervalued according to our criteria checklist: institutional buying/selling, insider activity, and short selling. Long term trading, otherwise known as position trading, refers to a trading style in which the trader will hold on to a position for an extended period of time. A position trade can last anywhere from a few weeks to a couple of years. Most long term trading traders rely heavily on fundamental analysis, as they are mostly concerned with the future outlook of the market they are trading. Our Long-term buys are generally held for a maximum of 90 trading sessions. We feel this period of time is long enough for a company to show to a minimum of 30-50% return on investment while also offering a lower degree of risk (as compared to our short or intermediate term trades). The stocks we seek in this category should meet several criteria: history of earnings, strong assets, positive cash flow, and low debt. A special situation refers to particular circumstances involving a security that would compel investors to trade the security based on the special situation, rather than the underlying fundamentals of the security or some other investment rationale. Emailed upon members request or we will e-mail this report to you when we think we can seize a nice profit on a stock, whenever that time is right. This is published whenever our analysts feel an exciting opportunity presents itself. With every new dawn there is a new trading session and opportunities are out there for those of us who chose to seize the day. This is your classic slightly higher-risk, high-return scenario. We feel these stocks are poised to move higher and could greatly improve your portfolio. Call us daily if your looking to Day Trade. On any given day we are monitoring dozens of stocks. Remember, we are here to help you! 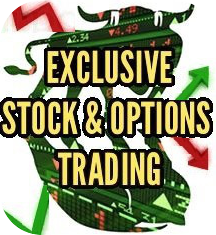 Options Trading refers to a contract that gives the buyer the right, but not the obligation, to buy or sell an underlying asset at a specific price on or before a certain date. An option, just like a stock or bond, is a security. It is also a binding contract with strictly defined terms and properties The contract offers the buyer the right, but not the obligation, to buy (call) or sell (put) a security or other financial asset at an agreed-upon price (the strike price) during a certain period of time or on a specific date (exercise date). There are 2 classes of options, CALL OPTIONs and PUT OPTIONs. Creative use of both classes leads to an almost unlimited combination of possible option strategies. Options trading strategies are capable of performing wonders such as profiting from BOTH an up or down move, or profiting even when the underlying stock stays stagnant! Calls, puts, and stock are the building blocks of all trading strategies. Buying or selling any one of these is a strategy unto itself. The structure is really about how any two of the three – calls, puts, and stock – can be combined to make the third. Synthetics are most useful to arbitrageurs who look for opportunities to purchase one instrument cheaper than they sell its synthetic, a process that can at times be somewhat complicated. Again, there are an almost unlimited combination of possible option strategies.(i.e. you can create a "synthetic" long call by buying stock and buying a put or you can sell "synthetic" stock by selling a call and buying a put with the same strike price). At BullsToBears.com, you get the right tools to help you manage risk and optimize options trades. Our approach is the simplest and most popular option trading strategy. Orders are placed on buying calls and puts that are a bet on the market direction. These high risk/ high reward trades rely upon making the correct call about the direction of the stock market or individual stock. They are called "directional" option trades. Stock Options make up a different market than the stock market, but these instruments are tied directly to shares of real stock. Unlike regular stock, options eventually expire, after which time they have no value and are worthless. Portfolio Analytics refers to a careful examination of different elements of the products of ones portfolio, which are used to determine the best possible allocation of the resources of a company. Secondly, in terms of securities, a portfolio analysis is one in which the investment portfolio is checked, in order to optimize the allocation of holdings. Portfolio Analytics is our procedure by which an investors portfolio is surveyed by one of our financial professionals to figure out if the present allotment of investments accomplishes his or hers short term and long term goal objectives - without having to endure unnecessary capital risks. Owning the correct stocks is fundamental to balance out the account over the long haul. Also, to advert the dangers of enduring stock market volatility which may include having to flee dangers of a sectors instability. When BullsToBears.com reviews your portfolio it is assessed by an expert who has the required knowledge and aptitude to legitimately assess all the diverse variables that influence day to day trading. With our complete portfolio examination, you'll have the apparatuses you need to settle on choices that react favorably to market fluctuations and variances.